One of my favorite buildings, a new "discovery" since returning to Atlanta, is Silhouette Midtown. Silhouette, built in 1964 and originally called 1447 Peachtree, was redesigned and repositioned in 2007—with great success. The previously non-descript, fade-into-the-background 10-story building has a totally new facade, landscaping, and interiors lending to a "museum-quality modern aesthetic." 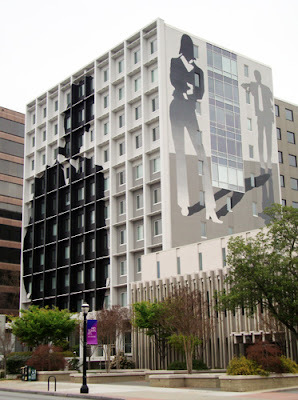 Dramatic silhouetted figures adorn the full-length sides of the building in white, grays and black. The illuminated square columns supporting a glass canopy, as well as a new fountain and landscaping, invite visitors to Silhouette. I've not been inside this office building, but have read that the interior spaces also incorporate silhouette elements and that there's a small "gallery-like museum of modern art" in the lobby. Silhouette is nestled in Atlanta's Midtown Arts District just down the street from the High Museum of Art and the recently relocated Museum of Design Atlanta (MODA).